Description: CSX SD60I 8754 leading a Birmingham, Al bound train out of the yard at Manchester, Ga. Description: Q640-04 (Cumberland - Buffalo) is westbound on #1 track with CSXT 8754 (an SD60I) and HLCX 6074 (an SD40M-3) pulling 114 cars at 14:40 pm on May 4th, 2002. We are looking eastward from a point about 200 yards east of the Bailey Road signals at mp BG123.5 on the CSX New Castle Subdivision. The away shot was a real treat; a few moments later, he is now leaning into the curve at the signals. We normally dont see a cut of Conrail 50 footers at the head end of this train. Very fun! Description: CSX 8754 leads a pair of GE units down the eastbound departure lead at Hamlet, N.C. Description: This unit was headed north running long hood forward. Description: Colorful all EMD powerset charges east on track one with manifest Q410 at Locust on the CSX Philadelphia Subdivision on a sunny morning. Description: Q425 heads west after holding for two eastbounds at CP109. 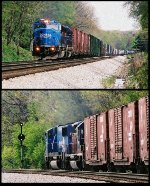 Description: Circus train power with a former Conrail SD60I in the lead. Description: Q425 pulls west out of the siding at CP-109 with a variety of powe including a smoking ex Conrail leader. Description: As this unit started off the siding it blew a flame as well as some oil then started to smoke heavily. Description: Conrail 8754 after the merger running North on the River Line. Description: CSX Unit Loaded Trash Train K277 Rounds The Bend At Skillman. Description: One of only two CRQ scheme SD60i's on CSX leads unit trash train K277 west at Bridgewater, approaching Port Reading Jct. to swing onto the Trenton Line on a fine afternoon. Description: A unit trash train led by an ex Conrail Quality SD60I heads south. Description: One of only 2 or 3 SD60Is remaining in Conrail paint on the CSX roster. Description: Sunnymeade Rd., 0813 hours.